If you had asked me this afternoon if I would like to see an extended performance of HONEYSUCKLE ROSE by a Teddy Wilson trio in 1963, I might have waited to be polite before saying, “Gee, I don’t think so.” I would have assumed that by that date, Teddy would have polished his routine: the glistening runs, the familiar arpeggios, the well-established beginning and end of what had become — through thirty years of regular performance — formulaic. If not dull. It isn’t always a pleasure to be proven wrong, but in the case of these two performances it’s a joy. And the Teddy Wilson trio featured not only the fine underrated bassist Jim Atlas (who appeared with Jimmy Giuffre on THE SOUND OF JAZZ in 1957) but Papa Jo Jones in splendid extroverted form. My first thought when this performance began is, and I understand it is both impudent and ineffective, “That tempo is too damned fast. Even Teddy seems to stumble in the beginning, deciding to deliver an abstracted version of the song — because the bars are going by too quickly to linger over the melodic line.” After a competent solo by Atlas, at about two minutes into the performance, Teddy and Jo begin to trade four-bar breaks — wonderful but perfectly familiar. I am amused that either there had not been a rehearsal of this song or the cameraman had been dozing, for he has trouble deciding where to focus while Jo is playing. So there are a number of breaks where Jo is heard but not seen until the cameraman (or woman, or men) figures it out. Wilson gets more exuberant — his stride was always a signal that he was both involved and excited — but begins to head towards the conclusion at around three and a half minutes, slightly more than a 78 rpm record’s time. But wait! Jo Jones has just stolen the show. “I’m having far too much fun. We are not stopping!” he says with his brushes and his wickedly joyous expression, like a little boy who refuses to come in the house when dinner is ready. And he hijacks the performance, most joyously. Yes, some of the four-bar breaks he takes in the second act he had been playing for decades — but his mischievous pleasure is wonderful. Then, expecting an anticlimax at best, I checked the other YouTube clips from the program: a Getz-McFarland C JAM BLUES, a Basie blues featuring Frank Wess and Frank Foster on flutes, both amiable but obligatory. Jack Teagarden was in the last year of his life and he had been travelling with a sextet like this for slightly more than a decade. 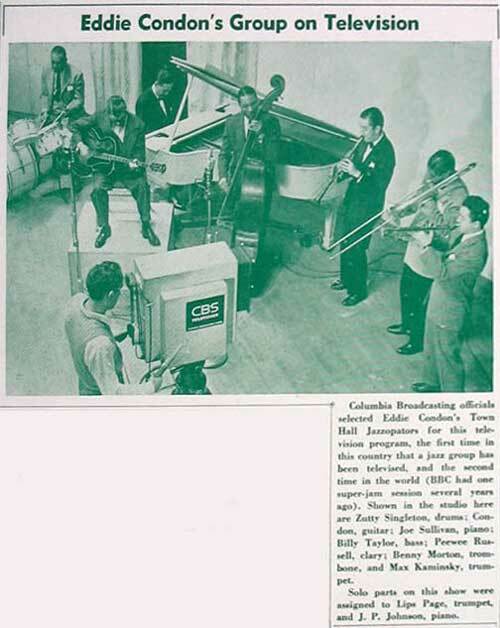 This edition featured Don Goldie, trumpet; Henry Cuesta, clarinet; Barrett Deems, drums; Don Ewell, piano, and a bass player who may have been Stan Puls. Meaning Jack and his band no disrespect, I must write that my heart sank when he eased into BASIN STREET BLUES, something he had been singing and playing since 1929. And the fake Mississippi riverboat behind him did not cheer me at all. Watching Teagarden here, I saw a man at what he knew to be serious work. I saw the skull beneath that impressive head. His eyes occasionally look deeply sad; his veiled expression is far away for a second or two. And perhaps because he wasn’t in the best health, he seems to struggle a bit in the instrumental portions. That’s a surprise, because he had spent his life making it look easy. But the result is revealing although not a note is new. The contrast between the slicked-down hair (or a hairpiece?) atop his head and his thinner-than-usual face; the small grimaces we catch him at during his solos, the earnestness he brings to words and music he had memorized . . . all add up to a very moving performance. And it is a delight to see Don Ewell (O rare Don Ewell!) serious and stately, exploring. There are only twelve notes in the octave; there are only so many ways even the most inventive player or singer can use to get from C7 to F or the reverse. But what is jazz all about except the art of making the most familiar sequences new and surprising through shifting an accent here, pausing a breath longer, entering into the material, whether it is a too-fast HONEYSUCKLE ROSE or an over-familiar BASIN STREET BLUES. Not only does the sound surprise us; jazz can make familiar gestures wholly new. The signature, although hurried, looks authentic — especially the final flourish. Perhaps someone who’s studied Billie Holiday’s performances, tours, and isolated club dates can tell us when she was in Marion, Ohio? This goes back to the idyllic days when hotels provided stationery for their guests — it was, as you notice A NEW HOTEL WITH A COMPLETE SERVICE — and people used fountain pens. 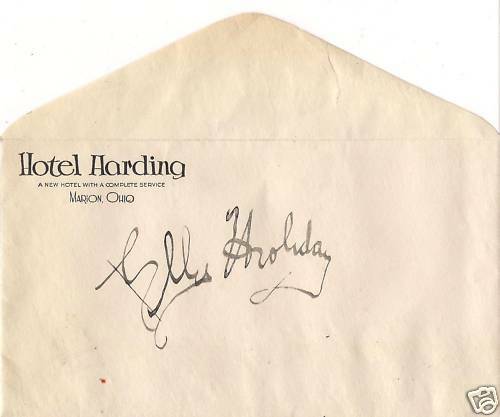 I imagine that some fan thrust a blank envelope under Billie’s nose and said, “Could I have your autograph, Miss Holiday?” and she signed it standing up . . . at least the calligraphy suggests this. I’d entertain alternate scenarios from any Holiday-fanciers. eBay, of course!